2018 New Year's Eve Fireplace Feast information. Start with some hors d’oeuvres by the fireplace as you watch your prime rib roasting to perfection on a device dating back to 1700. 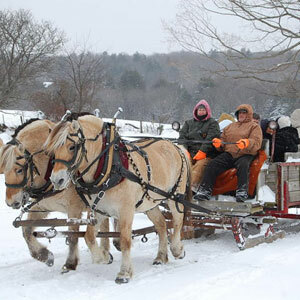 Take a horse drawn sleigh/wagon ride through the back fields then chase the chill away with some nice, hot, mulled cider or wine. 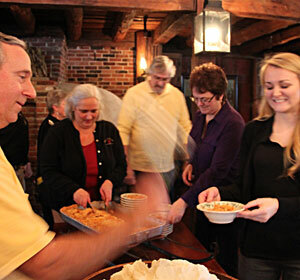 Relax, help make apple pie using an antique apple peeler and corer, or make seafood chowder in an antique iron cauldron right in the fieldstone fireplace. Next, get ready for the main feast! Start off with a champagne toast to the New Year, then sit back for dinner. You'll be served your fireplace seafood chowder and prime rib* (and later you’ll be offered seconds!). In addition, there will be bowls of fresh butternut squash, spinach pie and oven roasted potatoes. Don’t fill up on the homemade rolls, even though they are quite delicious, because you’ll want to save some room for the scrumptious deep dish apple pie with fresh whipped cream. Later, it's time to go downstairs to the Chestnut Room where a DJ will be playing and you can dance right through the midnight hour! Wear a party hat and use those noisemakers! It’s a great way to ring in the New Year! *If prime rib doesn’t tickle your fancy, salmon will be offered as well. Just order it when you purchase your tickets. 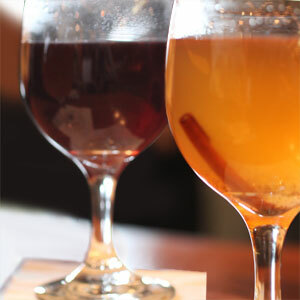 SAVORIES | Salem Cross Inn's famous cheese spread, hors d'oeuvres, and a glass of mulled wine or cider to help take the chill off after your horsedrawn wagon or sleigh ride (weather permitting). CHOWDER OF THE SEA | Help prepare our traditional New England chowder in a cast iron cauldron over a crackling fire. FROM THE KEEPING CELLAR | Herbed roasted potatoes, homemade spinach pie, and fresh butternut squash. NOTE: During Lent a fish entree may be pre-ordered. Advance notice required for dietary needs. Adults (13 yrs and over) $85 | Kids (12 yrs and under) $60 | includes all taxes and gratuities. The Fireplace Feast is an advanced ticket only dining event. or call us at 508-867-2345. To ensure your spot, make your reservation early. Seating is limited and the event fills up quickly!